Knowing so very little about this fascinating Russian Royal family’s history, I jumped at the opportunity to read The Last Romanov, by Dora Levy Mossanen (Sourcebooks). This is the story based on the life and times of the Romanov’s with a specific focus on Alexei's royal nanny, Darya (fictitious character). Rich in period history, Dora Levy Mossanen has written a vividly imaginative historical fiction for those who love a bit of magic sprinkled in their reading. I, however, mostly enjoyed reading some of the details that dealt with day-to day living of this royal family. The Tsar and Tsarina were both loving and fiercely dedicated to their family. Their devotion to keeping Alexei, the future heir of Russia, safe from physical harm and danger-while safeguarding this secret from the world, was almost all-consuming and borderline obsessive (but understandingly so). I felt for them as parents. Along those lines of total devotion surfaces the care and loyalty of Darya Borodina (whom the story is mostly about). With special, almost supernatural, powers (an opal eye) and with the help of an ‘ambergris’ mineral that gave strength, protection- with some hallucinatory properties, Darya helped preserve the Tsarevich’s health...up until the dreadful massacre that put a tragic end to this royal family. From thereon, Darya spends her days hoping to find the ‘lost’ Alexei and prove that he was not murdered; in order to bring him back to his rightful position to the throne. Surrounding the basic history of the Romanovs, the author spins a tale of magic, love, supernatural forces, past lives and more to tell another side of what might have been to the history of this majestically royal family. Lovers of fantasy mixed with historical writing will enjoy this one. PRESS RELEASE and EXCLUSIVE Special Offer!!! 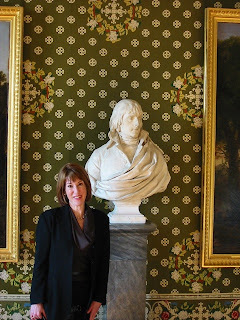 Last week I had the honour of having the fabulous Diana Reid Haig here on EBJ-History Salon. What an Author- What an Historian- and What a Book! TODAY I have ANOTHER Special Offering!! If you loved what you read here last week…then you will LOVE this!! 'Revelry. Revolution. Scandal. Fashion. Princesses. Prostitutes. Gambling. Gastronomy. Intrigue and bloody uprisings. Welcome to the Palais Royal, once called, “the capital of Paris,” and now the city’s loveliest shopping destination. Philibert-Louis Debucourt created this lively image ( La Promenade publique (The Public Promenade) of the Palais Royal in August of 1792, and critics have called it, “the masterpiece of French color engraving.” As the revolution became more violent, visitors to the Palais escalated their revelry. This new tour of the Palais Royal, written by Diana Reid Haig released by Rama, tells the history of this once-royal palace and childhood home of Louis XIV. The French Revolution is said to have begun there on a hot Sunday afternoon in 1789 when a young law graduate jumped onto a table outside a café and urged the Parisians, “To Arms.” This led to the storming of the Bastille, an infamous fortress and prison that was a symbol of royal corruption, two days later. During the 1790s Napoleon and Josephine made countless visits here and often dined at Le Grand Véfour, one of Paris' oldest restaurants, where visitors eat amid sumptuous, hand-painted panels of golden goddesses. 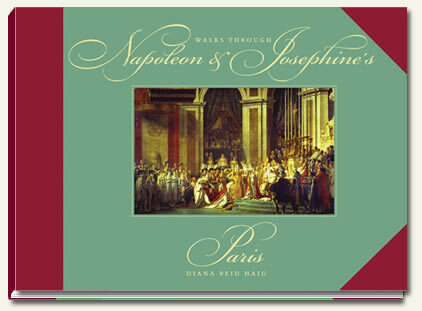 If you book in advance, you can even request the table where Napoleon romanced Josephine! For decades Napoleon bought his famous hats here at Poupard, one of the city’s finest hatters. When he became Emperor in 1804, Monsieur Poupard became his official purveyor. The bicorne, a dark military hat with two points, came to be a symbol of “the little Corporal." In the 21st century, the Palais Royal remains one of Paris’ loveliest spots. 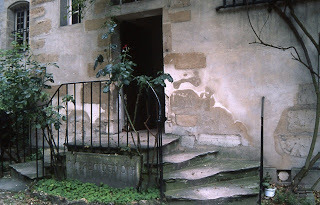 Few visual changes have been made to the arcades and garden, which appear almost the same as when author Colette, who lived in an upper apartment, penned Gigi. Despite its proximity to the Louvre, surprisingly few tourists visit this lovely destination now filled with the ultra-chic boutiques of fashion designers Stella McCartney and Marc Jacobs. The finest architecture, cuisine, fashion, and art wait at the Palais Royal, as they have for centuries. 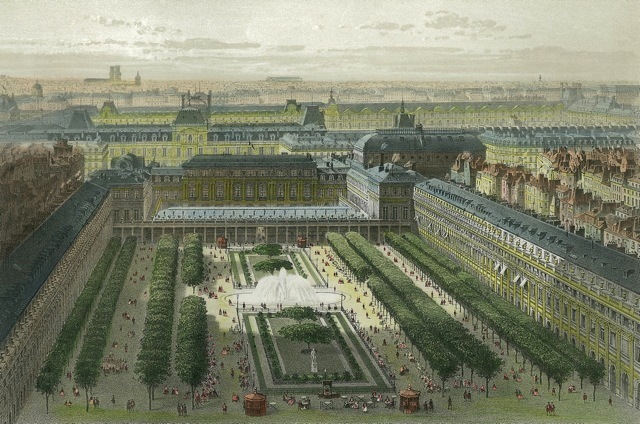 The Palais Royal in the 1800s. 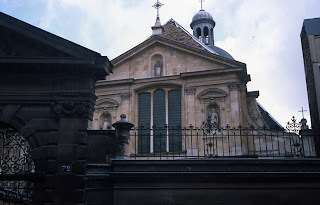 Then as now, it sits just behind the oldest section of the Louvre. NOTE: SPECIAL EXCLUSIVE OFFER!!! TODAY until MONDAY MIDNIGHT ONLY the price of this new app will be available to you for: only 99cents!!! This app is great not only for those traveling to Paris, but also for anyone, anywhere at any time- no need to be there in person. If you would love a private tour of this fabulous palace, fun-reading history (and you just know Diana's history telling is ever so stellar! No dreary text-book lesson here). Hurry and go and download it now! You will love touring le Palais Royal! Search for "Rama" under iphone apps. It should say "Rama - travel"
Open the app and search for Paris and then click on Palais Royal. Follow or mention our @RamaApp and @Rama_Food feeds when you post. 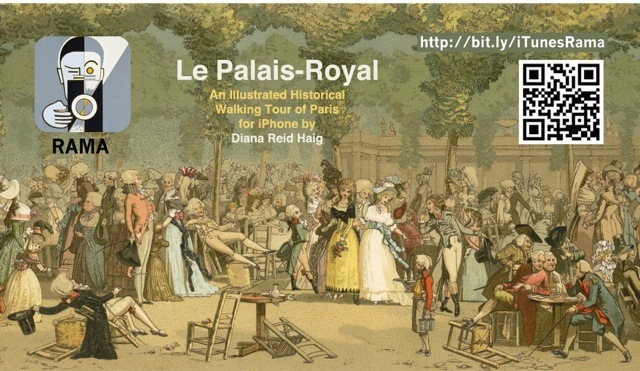 Join us today for a very interesting look at some fascinating bits of history, as Diana Reid Haig, author of Walks Through Napoleon and Josephine’s Paris, shares some of the most awesome photos I’ve seen upto date to go along with that history! In the photo below, is the entrance to the Carmes Prison. Note the red climbing rose on the bannister (which always makes me think of Josephine/Rose). 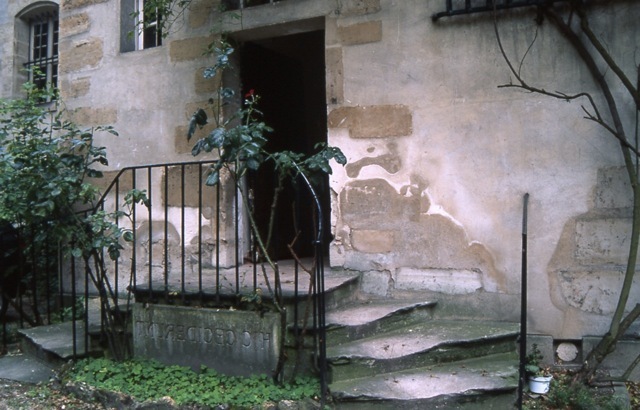 The saying in Latin carved by the steps means, "here they fell," and refers to the killing of many priests and prisoners on this spot during the September massacres of the French Revolution. A church, once a monastary, lies over much of the jail, and this is the exterior of the church. 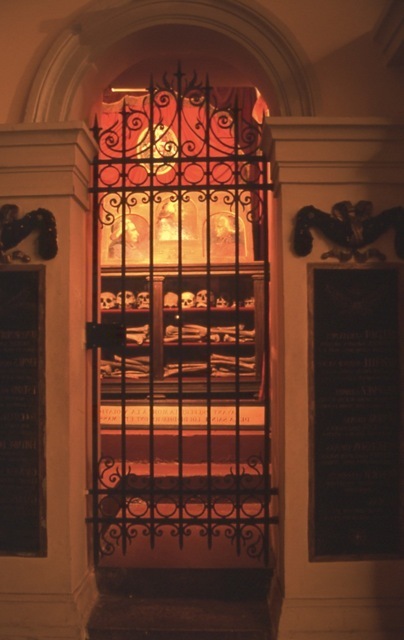 Deep inside the underground prison, they have vaults showing the bones and skulls of those murdered at the prison during the massacres. A beautiful English woman named Grace Elliot, who was imprisoned at the same time as Josephine, said that she and Josephine (who became friends) could never forget that they were in the prison where these massacres had so recently taken place. Grace Elliot said that the floor and chairs were still stained with the blood of the priests that had been murdered. 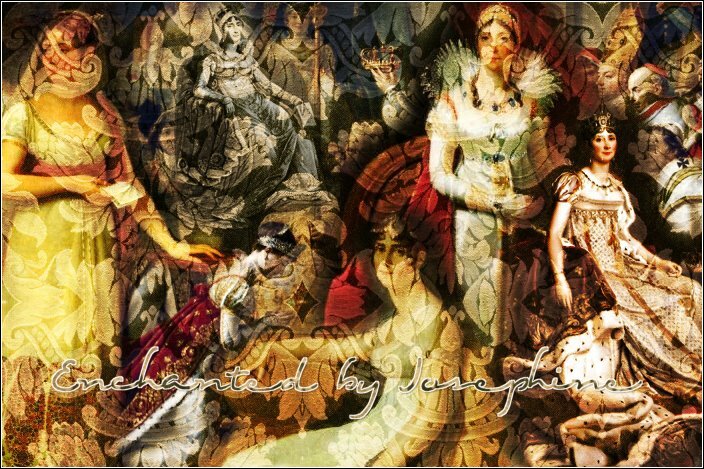 By the way, I wanted to tell you that Josephine was the person who led me to Marie Antoinette. As you know, Josephine is celebrated for her style, while Marie Antoinette isn't. I was surprised to learn that Josephine searched for the artist, Pierre Redoute, who painted Marie Antoinette's flowers. Josephine commissioned Redoute to work on several books of flowers for her. 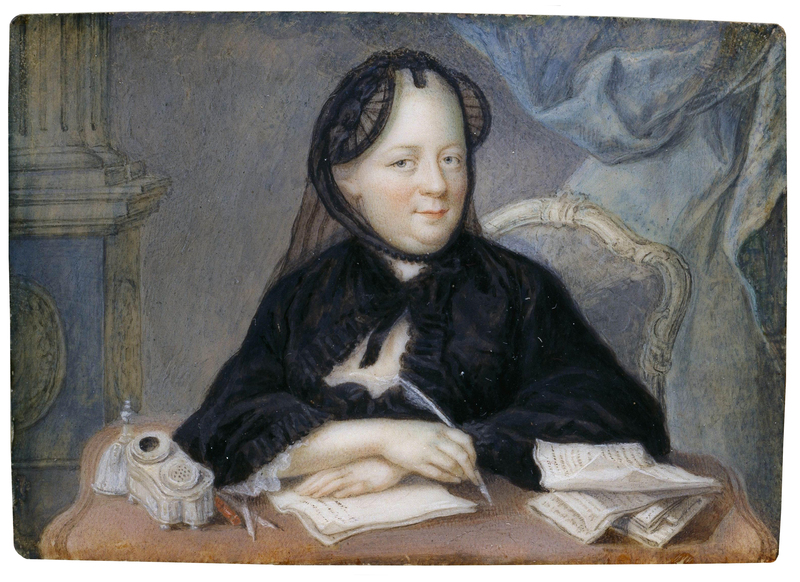 Josephine's art director and "personal painter" was Jean-Baptiste Isabey, who had painted miniatures for Marie Antoinette. Josephine adored the Etruscan designs that Marie Antoinette had used on her china and in her rooms at Fontainebleau. and the Empress incorporated many of those design elements so beloved by the Queen. were designed to sink into the floor by day, so the Queen could enjoy the view of her garden from windows. By night the mirrors were raised using a system of pulleys, so that the windows were completely covered and no one could look in. While I was there, they lowered and raised them for me. I was in heaven! ***Marie Antoinette was handed a book and a pin cushion filled with pins when she awoke each morning. The book contains swatches of fabric and descriptions of dresses. She put a pin through the fabric of each dress that she wanted to wear, and then gowns (with appropriate accessories) were pulled from her closets and brought to her rooms. There is only one book still intact in its entirety. It's in the French National Archives, and I wrote to them for almost three years before being granted permission to study it. When I was done, the guards asked me if I wanted my photo taken holding the book! I was speechless but quickly took them up on their offer. This book is one from the 1780s. All the rest were destroyed in the Revolution. She had two books for every year. Thank You So Much Diana!! What an incredible post. OMG! I can't imagine the feeling of holding that ever-so-precious book!! White gloves a MUST for sure! Comment on Every Post This Week and you Double the points for that day! Exclusive AUTHOR INTERVIEW -and- GIVEAWAY Continues! Today I have the honor of having Diana Reid Haig as host on Enchanted by Josephine -History Salon. Please read this wonderful interview and leave your comments for Diana. Also, remember that the Giveaway continues! 'With you know who. The bust is at Versailles near the Hall of Battles'. Diana, you are such a wonderful history author and it’s such a pleasure to have you here today! Please tell us how you became interested in history and a bit about yourself and your background. My grandparents were avid bridge players and had a deck of cards adorned with Delaroche’s famous painting of Napoleon. I remember staring at the cards, and the Emperor seemed to almost reach out and say, “I will be important to you one day, little girl.” I had no idea who he was. On the cards, he does not appear in royal garb but is dressed in his green military jacket with epaulettes. His intense expression alone grabbed my imagination. Just goes to show you can’t ever tell what will make an impression on a child. Incidentally, I still have the cards! 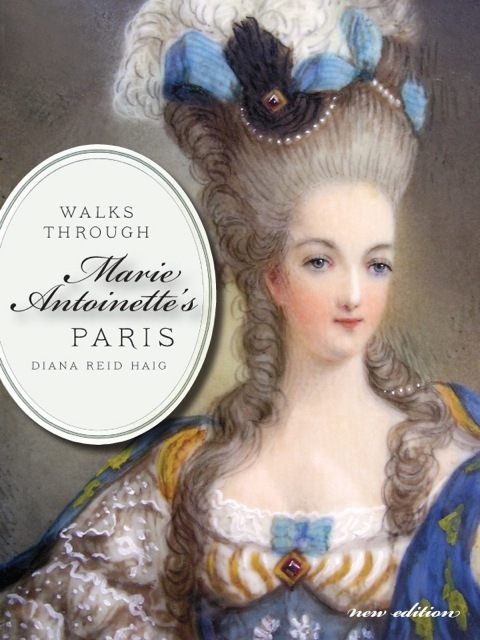 You chose dreamy Paris for the setting of both your books: Walks through Napoleon and Josephine’s Paris, and, Walks through Marie Antoinette’s Paris. Could you share with us how you came up with the idea and setting for these fantastic books? And- if you have any future plans for maybe another great city for your fans to ‘walk through’? 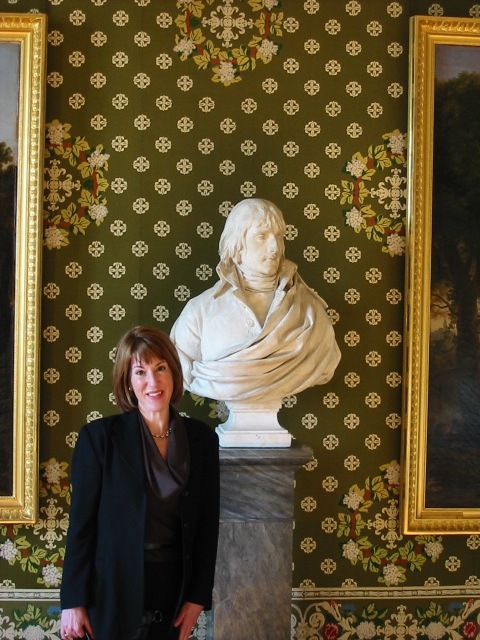 My husband and I love to travel and, fascinated by Napoleon and Josephine, I tried to visit many places that were important in their history. Sometimes the houses or churches would be hard to find, and I wasted a lot of time using Metro or RER directions that were incorrect. I started taking notes so that any friends who wanted to visit these spots would be able to get there quickly and see historical that I found were sometimes omitted from tours. You don’t ever want to meet your surgeon the morning of your operation but, luckily, I had a terrific doctor. She told me that I would have a long recovery and needed to take it easy for a while. So I brought my laptop into bed and began to type up my notes about Napoleon and Josephine hoping it would become a pamphlet. Some days I didn’t even feel well enough to do that, and I simply read. One of the books that I liked to read was about Paris. I noticed that the publishers had included an email address. I contacted them and told them that I was working on a project about Napoleon and Josephine’s Paris. To my shock, they called, set up a meeting and became my first publisher. I didn’t have an agent, and I still don’t (although I’d love one). I firmly believe that, “if I can do it, you can do it,” so I’d like to encourage any of you interested in writing a book. I’ve just finished my first app for the iphone and ipad. 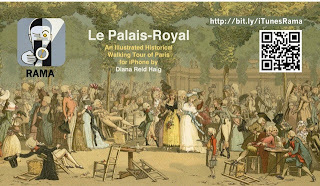 It’s a travel app about Paris’ Palais Royal and surrounding area. It has been fun to work in this new genre! I’m nearing completion of an eBook version of my title Walks through Marie Antoinette’s Paris, and this edition will include a new chapter and lots of wonderful historic images that we didn’t have room for before. I’m working on a travel book entitled Jacqueline Kennedy’s New York, for which I received a research grant from the Kennedy Foundation that allowed me access to many historical and wonderful photos and papers belonging to Mrs. Kennedy that are kept in their library outside Boston. Mrs. Kennedy worked tirelessly to save many historical buildings in Manhattan, including Grand Central Station. She adored classic buildings designed by Stanford White and Rosario Candela, and I find that style of architecture irresistible. Many stores and designers who provided the former First Lady with clothes and hats were based there, and some can still be seen today. I unearthed Halston’s original drawings of the pillbox hats that he made for Mrs. Kennedy early in his career when he was still a milliner working at Bergdorf Goodman. They’re beautiful, and I hope to be able to include some in the final manuscript. 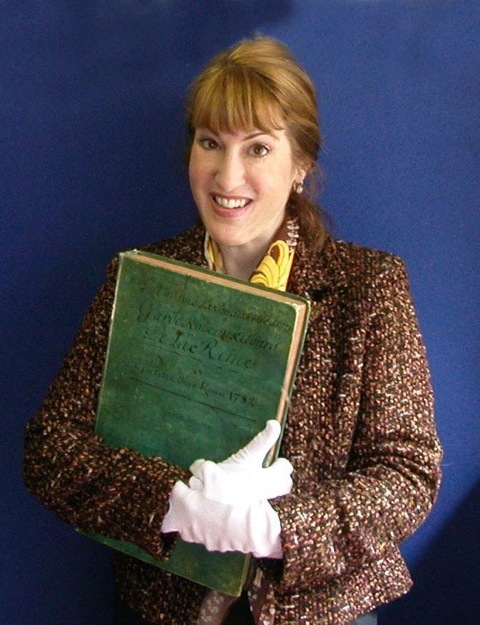 Diana, when browsing through your website I noted that your expertise and interests extend to other exciting venues! Please tell us more about what you do. 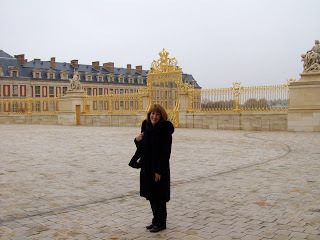 Until I wrote the book about Napoleon and Josephine, I had always worked in the music business. Over fifteen years, I compiled almost a hundred collections of popular American music. Sometimes I wrote liner notes to accompany the CDs or box sets, but primarily I put together the compilations (selecting the songs, finding the tapes, going in the recording studio to master the project). I did several albums that featured Brenda Lee and Patsy Cline’s recordings; they are personal favourites of mine. I also love classic R&B and worked on many projects for Motown. In closing, if you could choose one period in history you would love to have lived in, where would that be and tell us who you would love to have met? A brilliant man named Vivant Denon (for whom the Denon wing in the Louvre was named) who was a great friend of Josephine’s and became head of Napoleon’s museums. Besides being a great art connoisseur, Denon was supposed to have been a great charmer and raconteur. I wish I could meet these painters: the great Pierre Paul Prud’hon and his partner Constance Meyer, Mme. Vigee LeBrun, although I’m not sure that we would have like each other, the handsome and talented Jean-Baptiste Isabey (who painted so many lovely miniatures of Josephine and was her official art director). 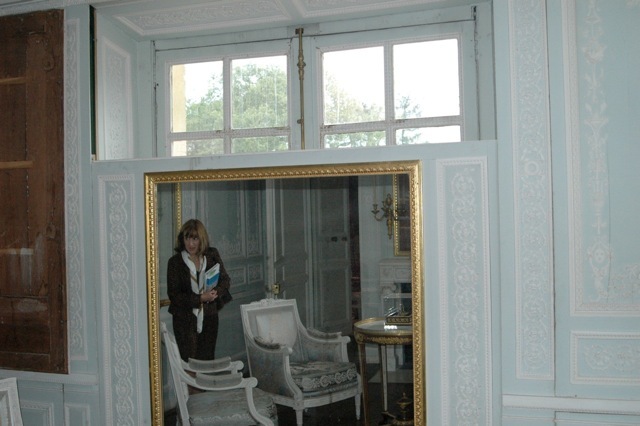 I would like to have met Napoleon’s younger sister, Pauline, and get a personal tour of her fabulous home (which now is the British Ambassador’s residence in Paris) and see the sterling silver cups she commissioned from one of Napoleon’s purveyors Odiot. They were made for drinking punch, and naughty Pauline used her own breast as a model. 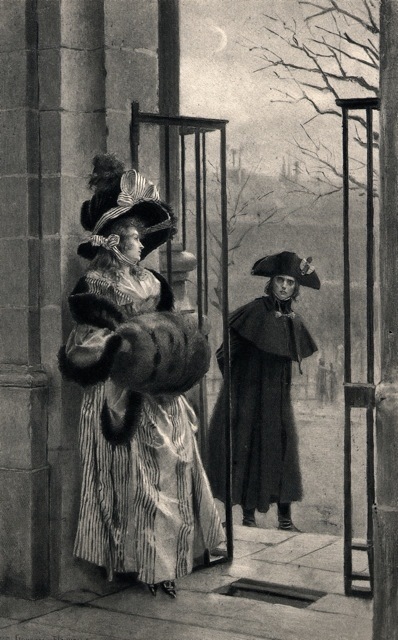 I would love to walk through the Palais Royal one spring night in the late 1780s at the height of its popularity and marvel at its decadence. Diana, thank you so much for letting us get to know you better. You are such an interesting person and a true inspiration for all aspiring authors, historians and readers of this genre. Thank you so much for your time and this fantastic interview. Please remember to come back tomorrow for a one –of a- kind Photo-Guest Post by Diana. Paris Extravaganza Week- Je vous invite!! !